Barack Obama's 'blackness' was questioned (again) at the recent CNN/YouTube Democratic presidential debate. A YouTuber asked if Senator Obama was 'authentically black enough.' While others debate this isse, AAEA has solved the problem. 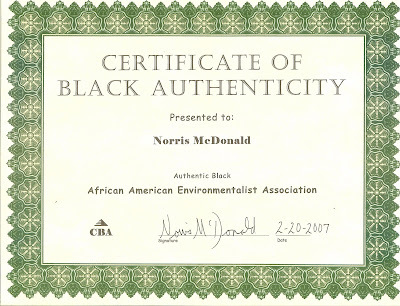 We have developed objective criteria for establishing one's black authenticity. We have sent Senator Obama his certificate. You too can certify your status by answering the simple quetions below. If you qualify, email us for your office certificate today. Frame it and proudly display it to eliminate those pesky questions. Please answer the questions below with a 'yes' or a 'no' to describe yourself. If you qualify, we will send you a certificate upon your request. You will have to provide your own frame. If you answered 'yes' to at least 7 of the questions, then you are an Authentic Black. To order your certificate click HERE. Leave you address and the certificate will be mailed to you. Clinton Flanking Obama on Environmental Justice?